Three people have been injured in a serious fire at a house near Brighton. East Sussex Fire and Rescue Service said they were taken to hospital with smoke inhalation following the blaze in Mill Close, Portslade, on Monday. About 20 firefighters, using an aerial ladder platform and breathing apparatus, spent about two-and-a-half hours tackling the flames. 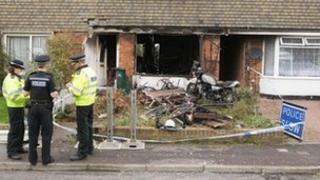 An East Sussex Fire spokeswoman said: "The cause of the fire at this stage is unknown and is being investigated." She said crews brought the fire under control just after 06:00 GMT.